St. Martin’s Cécilia Mobuchon chopped nearly five minutes off the 2-year old Ogier-Deloitte BVI Sunrise Half Marathon record on Saturday, when she dominated the field including the defending champion and record holder. Meanwhile, St. Lucia’s Michael Bissette buried his rivals for the overall victory in the 10thHalf Marathon of his career. 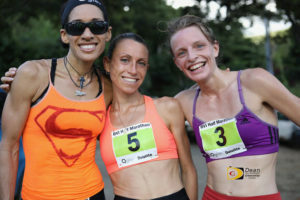 Returning from a foot injury that affected her training and kept her out of action till a month ago, Mobuchon, fourth overall, covered the 13thedition of the 13.1 miles two laps race between Road Town and Sea Cows Bay, in 1 hour 25 minutes and 40 seconds, after breaking away from the start. In the process she became the first woman to break 1:30, while demolishing St. Thomas’ Ruth Ann David’s 2016 mark of 1:30.21, and prevented David who was second in 1:37.15, from gaining her fifth title. As it was her first Half Marathon of the year, the French woman told Island Sun Sports that she was very motivated for the race and the only thing was running alone became mental battle. David was just happy to finish the race. She hadn’t been training as before and her work scheduled at the Ritz Carlton where she worked eight hours as a physical trainer changed after Hurricane Irma. Katrina Lindsay, third overall in 1:41.31, was the first BVI female finisher and said she was in awe of her amazing rivals and enjoyed the race. Just before the Road Town Ferry Dock, debutant Bissette, who ran with Clif Struiken, Julius Farley and DeGannes, crafted his move, then ran solo for just over 11 miles, to win in 1:19.49. Struiken followed in 1:20.51. Bissette told Island Sun Sports that In the first two miles, he normally goes out and test to see what the guys have. Struiken, who has dominated local races between two and 6.2 miles this year, decided to hold off the pace when the St. Lucian took off. Three time champ DeGannes said it was a tough race and described his performance as being “lack luster” adding he probably shouldn’t even have participated. Virgin Gorda’s Velma George who lives in New York and held the BVI Marathon record from 1993-2016, was running her first BVI Half Marathon. Final results. Men: 1. Michael Bissette, 1 hour 19 minutes and 49 seconds. 2. Clif Struiken, 1:20.51. 3. Julius Farley, 1:24.40. 4. Shane DeGannes, 1:39.52. 5. Joceran GGichuke, 1:41.07. 6. Michael Khilloury, 1:41.53. 7. Colm Rafferty, 1:44.50. 8. Richard Hadley, 1:46.19. 9. Shaun Reardon-John, 1:49.14. 10:Jacques Roux, 1:49.45. Women: Cécelia Mobuchon, 1:25.40. (New Record. Old Record, Ruth Ann David, 1:30.21., Dec 3, 2016)2. Ruth Ann David, 1:37.15. 3. Katrina Lindsay, 1:41.31. 4. Kim Struiken, 1:45.52. 5. Rosmond Johson, 1:48.45. 6. Maria Mays, 1:52.12. 7. Chole Harris, 1:55.58. 8. Rebecca Paul, 1:56.16. 9. Lauren Williams, 1:56.47. 10. Shuen Chai, 2:03.22.